An Arizona legislator is proposing a plan to eliminate the registration labels that appear on the state's license plates. Eliminating the registration stickers drivers are required to affix to their car’s license plate could save Arizona $1.8 million, says a state legislator. 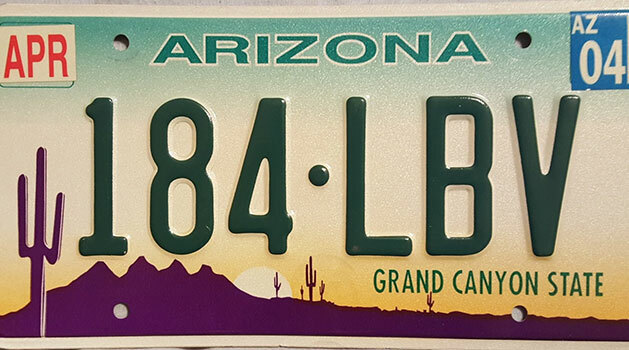 House Bill 2054, introduced on January 9, would save the state money on printing and mailing license plate tags, but still would not allow drivers to operate a vehicle with an expired registration, clarified Representative Michelle Ugenti-Rita (R-Scottsdale). If the bill passes, the Arizona Department of Transportation (ADOT) would require drivers to keep a registration card in their vehicle at all times. The agency would send an electronic card for drivers to print out, or mail the card upon the driver’s request. However, there are opponents to the license plate tag bill. “Some people would probably skirt around it and not [stay current on their registration], and then take their chances on not getting stopped,” said Representative Noel Campbell (R-Prescott), who chairs the House Transportation Committee. As it stands, Arizonans can keep their license plate until it becomes “damaged, deteriorated, illegible, or unreadable,” according to ADOT. Police officers often look to the small registration tags as a quick way to determine if someone is driving on an expired registration, especially in cases where the plate is not easily read. “Is that enough to justify incurring costs that otherwise we, as a state, don’t need to?” Ugenti-Rita asked. Officers can simply run the license plate number when checking a registration’s validity, and pull the driver over if the license plate number returns an expired registration, she said. Furthermore, Ugenti-Rita compares the possible change to how the state already handles car insurance. Ugenti-Rita’s bill is awaiting debate in the Arizona House of Representatives. While this is new for Arizona, other states have enacted similar legislation; Pennsylvania, New Jersey, and Connecticut have all done away with tags on vehicle license plates.